The nomad is back. It’s been 8 months, and now I’m on the other side of the world…again. Lots more to come so let’s get started. Peaches are in harvest, and I for one am ecstatic. Since moving to endlessly sunny California, we’ve experienced produce more flavorful, colorful, and riper than any other state could match. Avocados that inspire obsession, exquisitely buttery squash and candy-like heirloom tomatoes. But surprisingly, the peaches fell short. For two months I’ve staked out our local market for sweet yellow peaches. But the California varieties were always rubbery and a bit sour, despite the “tree-ripened” claim. Then Idaho saved the day. I always assumed the great South was responsible for juicy peaches. Georgia, Parker County in Texas and South Carolina among the best. I stand corrected. One taste of these reddish-pink peaches and my eyes rolled back in my head. 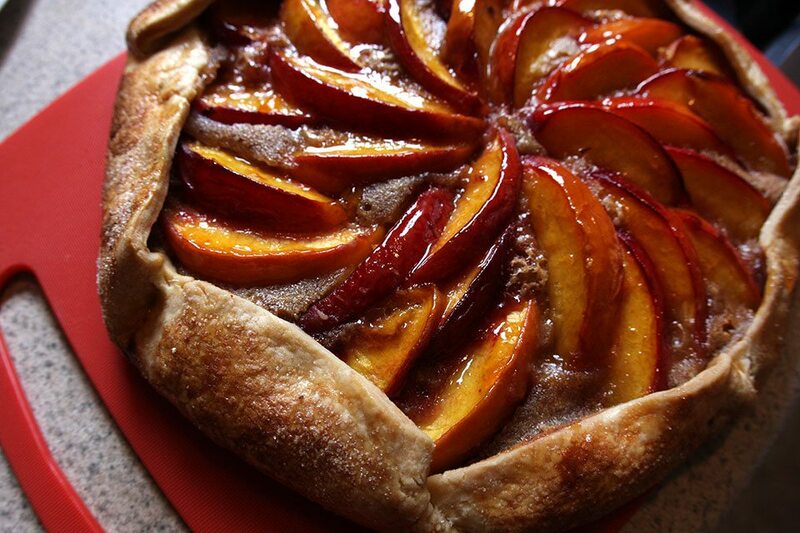 So this week, we celebrate the brilliance of sweet peach season with a Peach Brown Butter Almond Galette, and later this week, Chipotle Peach Jam. As I have recently moved, I am severely devoid of most kitchen utensils and gadgets. So my experiments and treats have had to be “mixer-free”, which as a pastry chef is somewhat of a challenge in this age of food processors and stand-up mixers. But the glorious tradition of French pastry wasn’t sponsored by KitchenAid. Anything is possible. 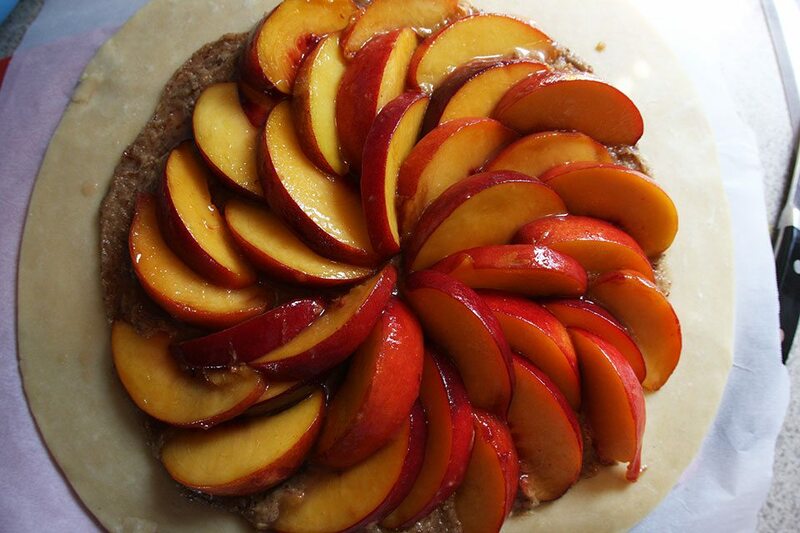 This galette is truly handmade, no electronics required. Except for an oven, that is. Start with the dough. In large bowl, combine flour, salt, and sugar. Mix. Add cold cubed butter. With hands, break up and rub the butter into the dry mix. When the mix has a coarse texture similar to little peas, add half the water. Gently mix. When the dough has had enough water, the crumbs of dough should stick when pressed together with your hand, but not soggy. 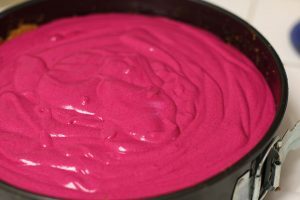 If mix is still too dry, slowly add a couple spoons of water at a time until consistency is reached. Dough will still be crumbly, dry in some places and wetter in others. That is okay, it will all even out in the fridge. Form a rectangle of dough, wrap in plastic and chill for one hour. Pull out the dough and cut in half. Re-wrap the second half and freeze for later. Lightly dust your bench, or counter with flour. Roll out dough to circle approximately 1/4″ thick, which will be approximately 8-10″ in diameter. But thickness is most important. Set dough on parchment lined sheet pan and cover. Chill for 30m. While dough is chilling, start the frangipane. Brown butter in small sauce pan until the bits (milk solids) sink and turn dark brown. Stir occasionally as it browns to keep bits from burning, instead of browning. (For step-by-step photo instructions on how to make brown butter, check out Brown Butter 101.) In bowl, whisk together sugar and almond flour. Whisk in brown butter. 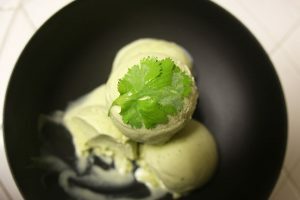 Wait 2 minutes for mix to cool down, then quickly whisk in egg. Preheat oven to 375F. For the filling, combine sugar, cornstarch and salt in large bowl. Add peaches and vanilla. Toss. Let sit at least 20m, tossing occasionally. Take out dough. Place 1/3 c. frangipane in center of dough. (Extra frangipane freezes extremely well.) Spread out frangipane, like it was pizza sauce, into circle 3″ smaller than the dough. 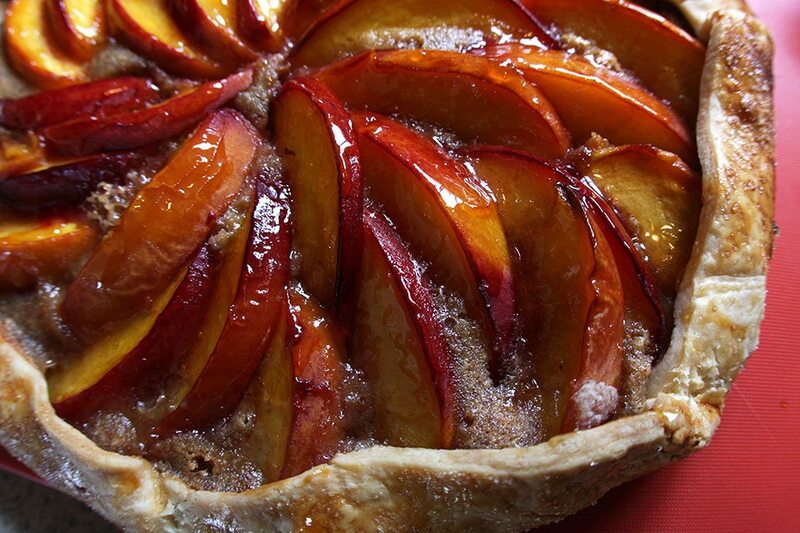 Arrange peaches with juice on top of frangipane. 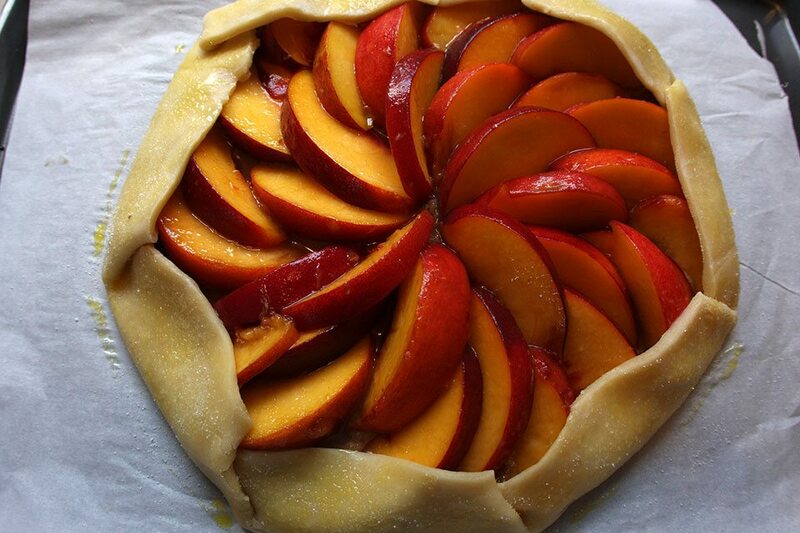 Gently fold the dough over the peaches. 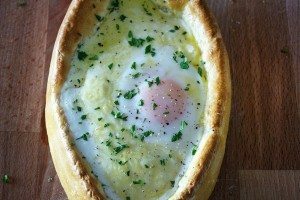 Use egg yolk mix to glue the dough as you crimp it. Brush dough with egg yolk mix and sprinkle with sugar. Bake 1 hour 5-15m, until crust is golden brown and frangipane is set. 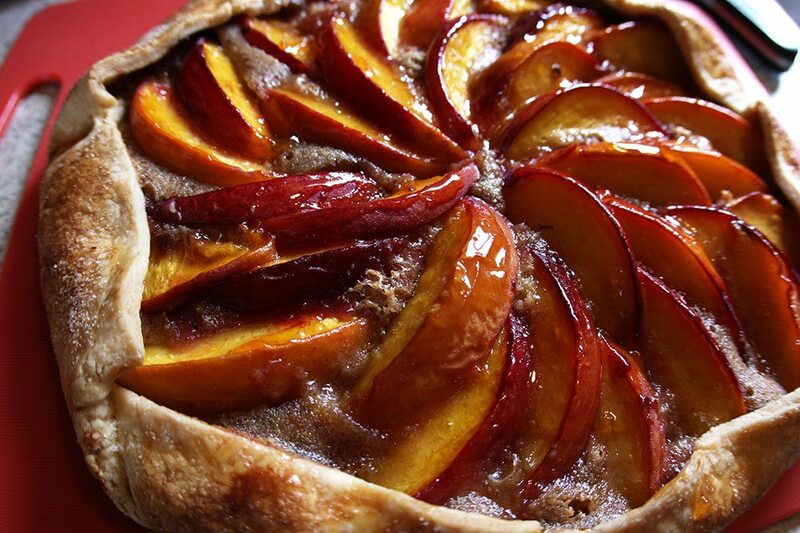 While galette is still hot, finish by lightly coating fruit with warm jam to shine it up and seal the fruit. I glazed mine with the Chipotle Peach Jam I made the day before. 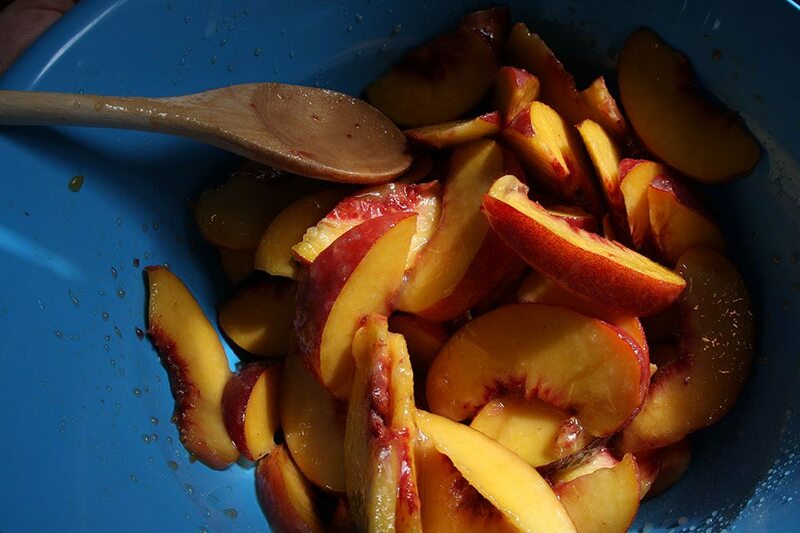 Use nectarines, plums or berries instead of peaches.